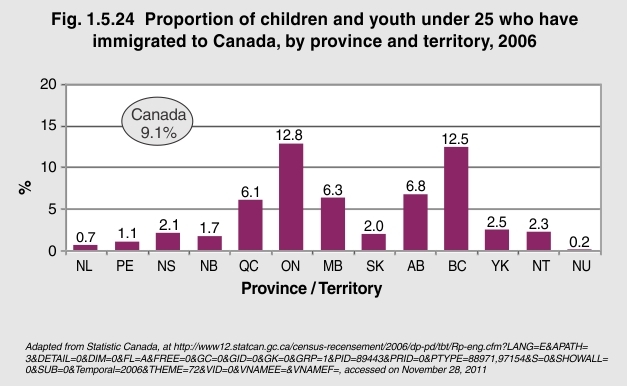 In 2006, there were 894,960 children and youth under age 25 living in Canada who had immigrated from another country, which represented 9.1% of the total population of children and youth in Canada. Of those, 345,705 were between birth and 15 years old, and 549,255 were aged 15 through 24 years. There was substantial interprovincial variation. More immigrant children and youth lived in Ontario—almost 500,000, or almost 13% of the total population of children and youth in the province— than any other province. British Columbia had over 151,000 children and youth who had immigrated to Canada, accounting for 12.5% of the province’s total population of children and youth. In Québec, immigrant children and youth accounted for only 6.1% of the total child and youth population.